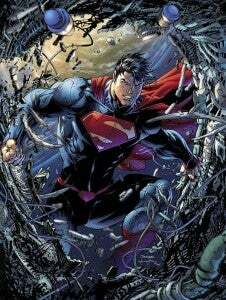 Scott Snyder and Jim Lee's ongoing, monthly Superman comic, which has been rumored to be called Man of Steel since before the project was official, will in fact be titled Superman Unchained ,according to USA Today. The series will also feature backup stories by Snyder and artist Dustin Nguyen, according to the newspaper. The first issue of the series will be in stores on June 12. Its title coincides nicely with that of Superman Unbound, a feature-length, direct-to-video animated feature film, which will be released in May. "We're all fans and we've all known this character for a long time," said series artist and DC Co-Publisher Jim Lee. "You have to fight your natural tendency to do what you know or what you've always thought the character to be. We've been pushing the creators to not be beholden to the past conceits and understandings, so we will speak to a new generation of readers." "If I think for a second, 'I'm working on Superman,' you get chills and it becomes very, very intimidating when you think of all the amazing stories that have come before," said Snyder. "The way to approach a character as iconic as him is you just come at it from a standpoint of what you love the most about the character, and then write a story that explores that, tear it down and build it back up." Snyder also explained that (unlike the other Superman titles since the launch of the New 52), the Man of Steel's supporting cast will get some serious page time in the new title, saying, "I know conceptually why he admires Lois Lane, but then when you're writing them and you feel the chemistry between them and it comes to life on the page, it's always these little bursts of surprises that have been a joy to discover with him."